I saw a huge bed of poppies in Pointe Claire on Sunday and made a mental note to get back there quickly to sketch them before they go. This morning the weatherman was predicting heavy rain and thunder showers which could mean that these will be damaged by tonight. As I write this the sky to the west is a menacing blue-black so I’m glad I captured them in time. Painted on a 1/4 sheet of Fabriano soft press paper. Once again your design sense shines through (pun intended!). The color is vibrant and the composition so well conceived that the eye is compelled to take it all in. I particularly like the brushwork in the lower right with the layering of positive and negative shapes. The delicacy of the stems and leaves in the upper right add a grace to the composition and draw the viewer into the distance. Beautiful stuff! Thanks Jeff. I did have a good time painting this and I tried to take my time in painting it instead of rushing things. Glad you like it. Love the freshness and spontaneity. Just beautiful! Just curious if you did flowers first and then ground, sky or painted around the white design of flowers to so background the painted flowers? Inquiring monds want to know. So sorry bad typing that was flowers first or ground and background first. Good question. I did spend a bit of time thinking about the order of things for this. In the end I decided to paint the flowers first. I wanted the red to be very saturated and I wanted to make sure that the pattern of flowers made a nice shape. Thank you so much! Would love to take a classes with you. Unfortunately I am in the Chicago Area :(. Mary, if you have enough people in your area you can invite me to give a workshop there. I’ve always wanted to visit Chicago! I’m really impressed with how you captured the texture and shape of the poppy petals. I think they must be a little challenging to paint because they have soft curves but they also have angular edges. These were not as hard as some other flowers. I always seem to have difficulty getting the shape of tulips right but these were relatively easy. Absolutely stunning.I love the menacing storm in the background and the unsuspecting poppies in the foreground. And on the instructive side, this is, for me, a wonderful example of the power of contrast of just the right green against the red. Thanks Alison! I used lots of cerulean blue in this green mix because the poppy leaves are quite blue. I also added a lot of yellow to separate foreground from background. The dark area at the back is a wall but I like your image of the menacing storm better. This drew me right in! Gorgeous! This reminds me of Provence! Love it. Thanks Mike. And a friend who is cycling from Istanbul to Amsterdam just sent me a photo of herself (somewhere in Hungary, I think) in front of a field of poppies too. Now THAT’s gorgeous!! You did such wonderful effects in the center of the flowers and in the green beneath them. Just the precise right amount of hard edge contrast in the right places. Now THAT was so much fun to paint! Glad you like it. And you should have seen the rain come down this afternoon. I should drive over and see if they are still standing. Gorgeous drawing! I was in Provence last week and there are poppies everywhere at the moment. It’s beautiful! You managed to capture them so well, I feel like I’m back there. Lucky you Beliza! I think everyone has some wonderful memory of seeing poppies. They are so outrageous when you see them all together, I couldn’t resist painting them! 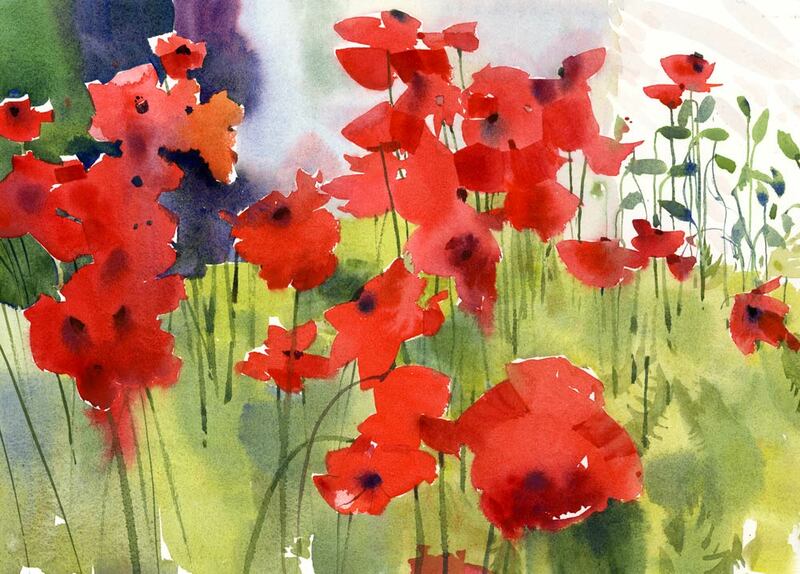 The essence of poppies, the essence of watercolor and the feeling of the beauty of life all in one painting. Feel free to take a bow. The greatest compliment I can get George. I will cherish it.